You should visually identify which pulley/pump you have before ordering regardless of model year!Mid-way through the production run for the 2000 model year Ford changed the design of the water pump on the 4.6L engine however the change is apparently based on the origin of the engine and is not specific the model year. The early style pump had a longer shaft. The later design of the pump was changed to a shorter shaft. This necessitated a change in the design of the pump pulley. Read on. The early water pump pulley had a convex or ''bowed-out'' face and the later design has a concave or ''pressed-in face''. There is no exact changeover date for the pump and pulley. It is important to visually inspect your car to see which design you have. Supposedly the changeover occurred in January of 2000, but we have seen cars with identical January build dates and different water pumps and pulleys. 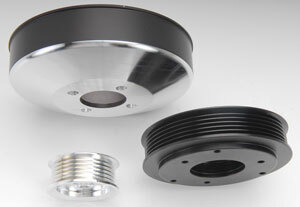 We have also seen the early design pulleys used on a few 2002 models, so be sure to check your vehicle before ordering. Refer to the pictures below to determine which pulley design you have. Since there is no definitive answer as to the time line or model years, we will refer to the pulleys from each manufacturer as early and late design. Note: The face is (convex) bowed outward. Note: The face is (concave) despressed inward. Does March Performance 2255 fit your vehicle?